Similar to other credit cards, AmEx card holders have been able to use the rewards points they earn for flights hotels, retail purchases and access to concerts and sports events. Today, AmEx is taking this a step further by allowing users to access membership rewards points at point of sale, via a VeriFone integration. In a new partnership announced today, AmEx will allow card holders to use their points to pay for their fare in VeriFone-enabled NYC taxi cabs. We’re told that VeriFone’s in-taxi devices (the screens in the back of taxis that allow you to swipe and pay for your fare via a credit card) process more than 200,000 payments a day in more than 7,000 cabs throughout New York City. 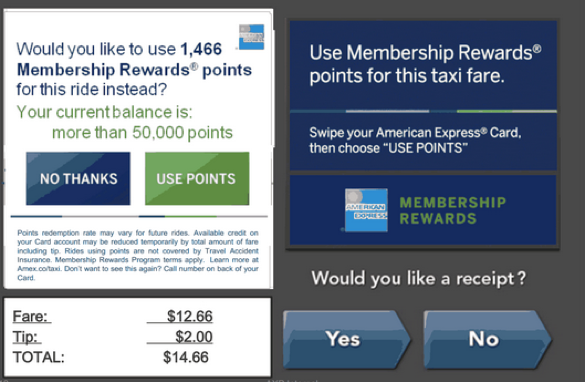 At the end of the ride, AmEx card members who have chosen to pay with “Credit” will be prompted by the taxi TV screen to swipe their Card, as usual. After the payment is processed, Card Members who are enrolled with membership rewards will be shown their current point balance, the number of points required to redeem for the ride, and on-screen buttons labeled “Use Points” or “No Thanks.” Card Members that choose “Use Points” will receive on-screen confirmation that the points have been redeemed. If a Card Member chooses “No Thanks,” or does nothing, the payment will be processed as usual. The big takeaway from this integration is the ability to redeem points at point of sale. Considering VeriFone’s widespread use as a point of sale system, you can imagine other integrations that could be rolled out at restaurants, stores and more. No word yet on the next integration, but VeriFone does enable payments in 70,000 taxis worldwide, so perhaps AmEx will expand the partnership beyond New York. A few weeks ago, AmEx debuted a partnership with TripAdvisor to allow members U.S., U.K. and Australia can connect their American Express Cards with their TripAdvisor profiles to post verified AmEx cardmember reviews, access exclusive lists and get special merchant offers. And earlier this year, AmEx announced an integration with Twitter to allow cardholders to use hashtags to buy items.